Those Left Over Leaves Fell Here! You may recall a blog post I did in late August with cut out leaves. You can see that post here if you like. In that post I mentioned they would show up in a future post, and here they are. I wanted to use a blue background, as I think it can create a beautiful masculine look, which I wanted for this card. I found a perfect fit in a piece of Best Route DSP which has lots of Blueberry Bushel in it. I love this new In Colour, so was happy to use it for this card. 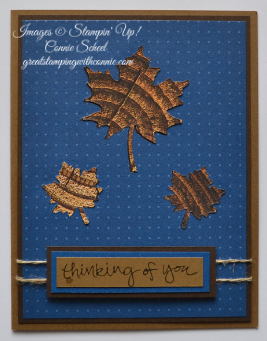 I used layers of Soft Suede and Early Espresso to coordinate with the wood texture colours in my DSP leaves. The sentiment is from the Sheltering Tree stamp set. I finished it all off with a couple of strands of Linen Thread behind my greeting to keep with the natural and masculine theme of the card.